More decisive action from bears today as markets lose support. The S&P undercut the rising trendline and 20-day plus 50-day MAs in a move which looks like it could develop into a test of the February spike low and the 200-day MA again; support at 2,695 is looking critical here. Aggressive traders could look to buy at these levels but confidence in this holding would not be high. The Dow also saw its 'bear flag' / consolidation triangle resolve to the downside. The two positives were the relatively light volume and the uptick in relative performance (by virtue of lighter loses versus Tech averages). A rally tomorrow could set up a 'bear trap' which would be an important marker for further gains. 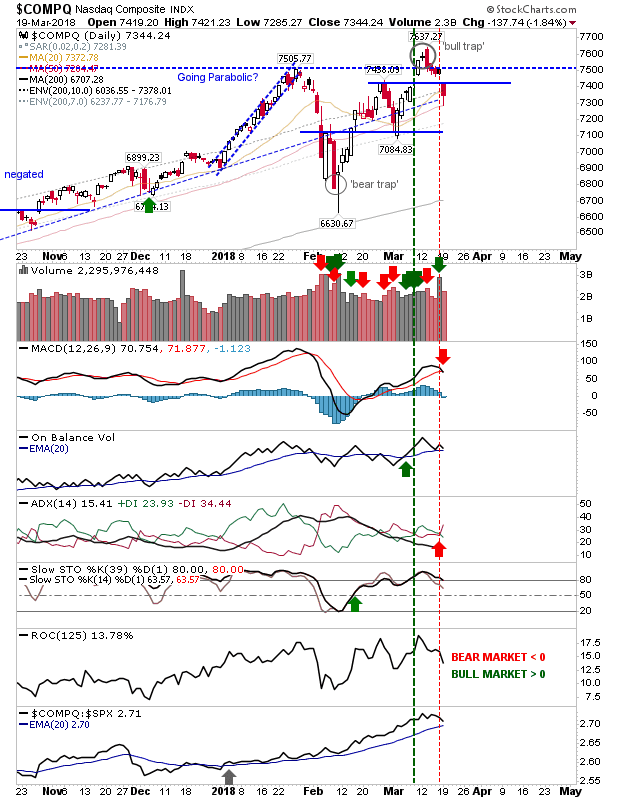 Technicals saw a new 'sell' trigger in the MACD, leaving just On-Balance-Volume as the one indicator preventing a clean bearish sweep. The Nasdaq and Nasdaq 100 both struggled. 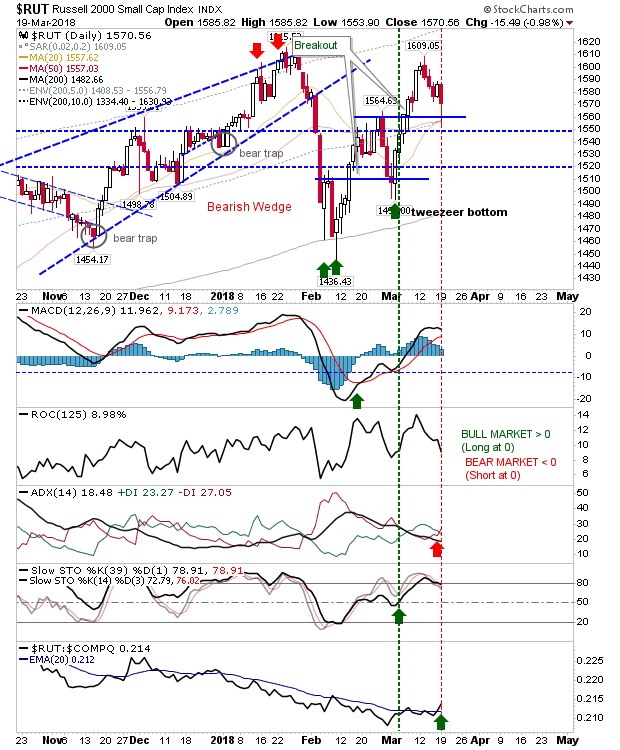 There was a gap down in the Nasdaq as ADX and the MACD shifted to a new 'sell' triggers. Today's action confirmed the 'bull trap'. 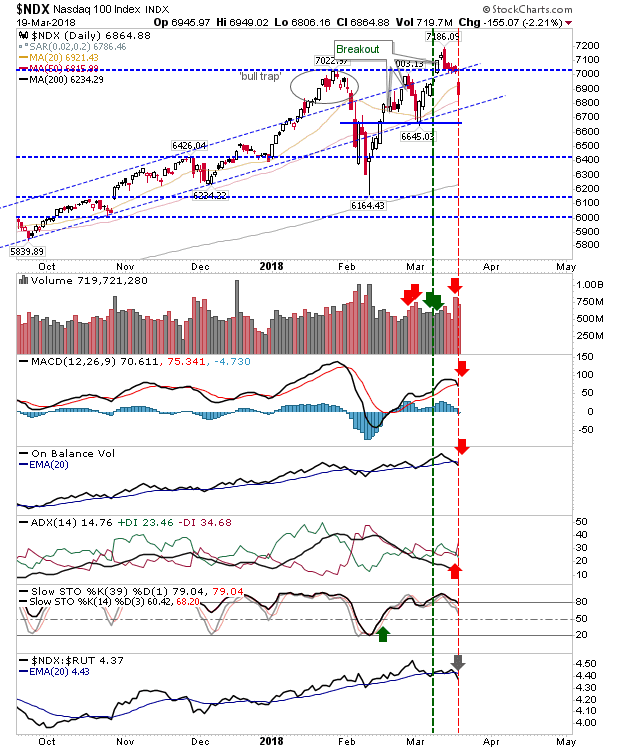 The damage was more acute for the Nasdaq 100 where loses over 2% were registered today along with new 'sell' triggers for the MACD, On-Balance-Volume, ADX and a relative loss to the Russell 2000. Ugly day for the index. The only index to come out relative unscathed was the Russell 2000. While it didn't escape the selling it did manage a positive spike low and test of 1,565 support and converged 20-day and 50-day MAs. Note also the sharp uptick in relative performance after months of weakness. Bulls may find a silver lining from this index. Tomorrow will be about consolidation. 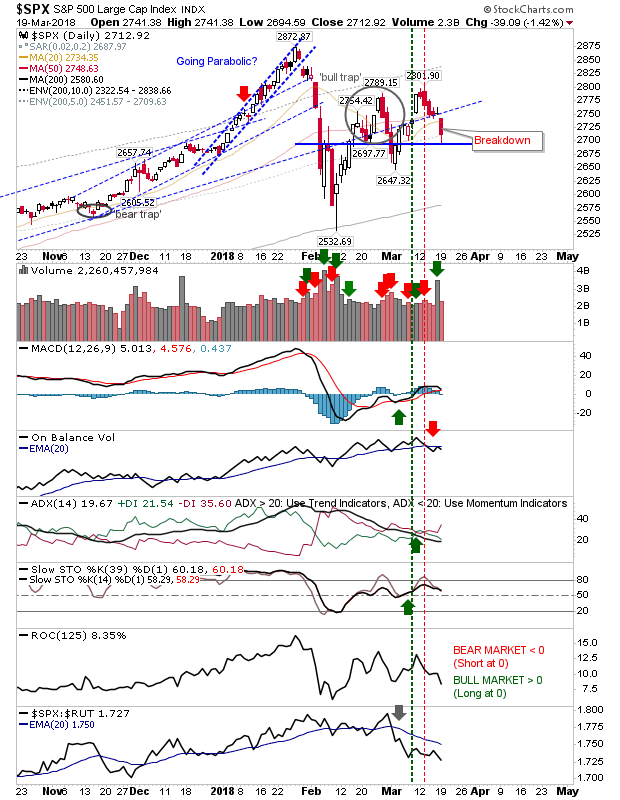 Shorts will not want to see today's loses erased as there is still a high risk of 'bear traps' - although action in the Nasdaq and Nasdaq 100 does suggest a more prolonged period of selling looks ready to emerge. 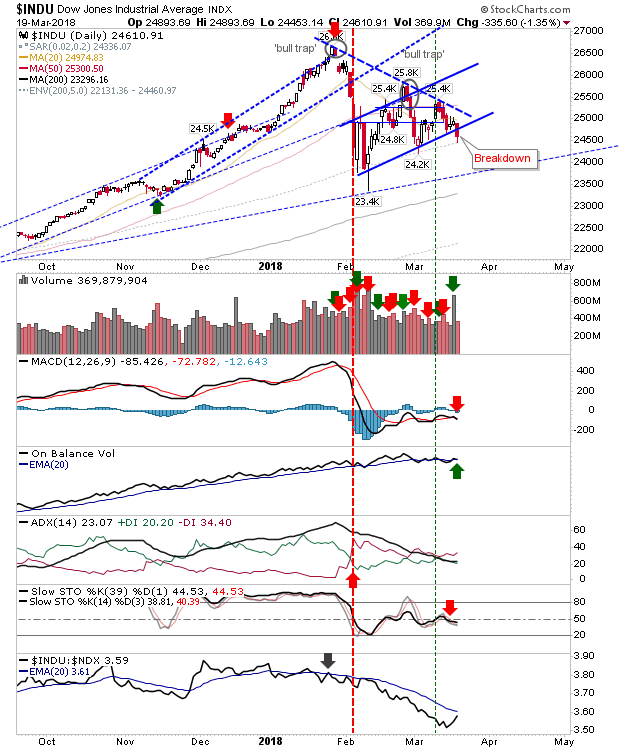 Bulls can look to the Russell 2000 and even the Dow Jones Industrial average for opportunities but any weakness into Tuesday's close may be reason enough to bail out of any new long position.